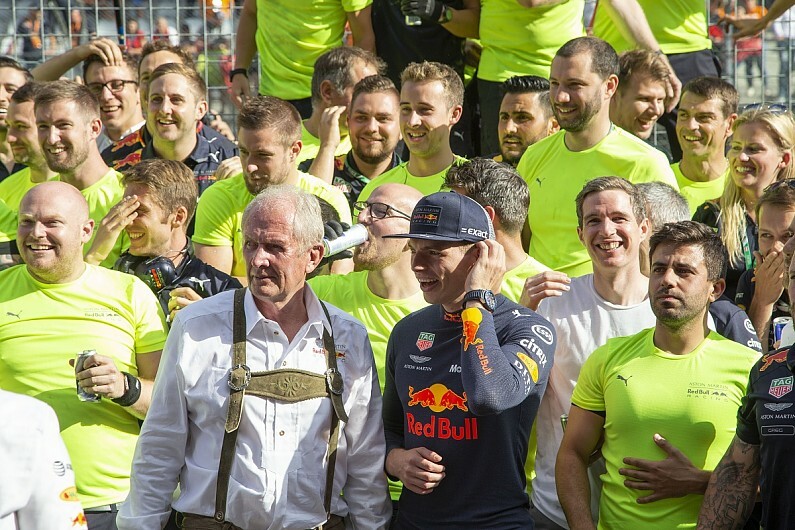 Red Bull motorsport advisor Helmut Marko says Max Verstappen showed "champion's quality" during his drive to victory in Formula 1's Austrian Grand Prix. Marko praised the way Verstappen controlled the Red Bull Ring race from the front and saved his tyres, while adding the Dutchman had punished himself earlier in the year with mistakes, without which he could be in the drivers' title fight. "All these critics that were talking in the beginning of the year, he showed them that it was absolute rubbish," Marko told Autosport. "He had to nurse the tyres, and we also turned down the engine around mid-race, because of safety and technical reasons. "And he still managed to keep up this speed which was necessary to keep Raikkonen behind. Only three or four laps from the end, when it [the gap] was three second, did we turn the engine up. "He was so smooth, he controlled it, he never got any panicking whatsoever. It was like Barcelona [Verstappen's first win in 2016] a little bit. "He's grown up. He punished himself very much, he could be battling for the championship. "Sometimes there was bad luck, there were only two stupid accidents - one was Monte Carlo and the other one was in China with Vettel. "But at 20 years old to drive such a race, that shows what champion's quality he has. He's done three good races [in a row] now, and all three were unbelievable." Marko said the team's first win at its home circuit meant a lot to Red Bull. "More than happy," he said. "It was 2014, the first GP on this circuit [since Red Bull took over the track], and it's always been won by Mercedes. So it's the first time we won, and we beat Mercedes. "[It was] an unbelievable driving performance from Max, and we're also very happy for the thousands of Dutch fans. "All in all a fantastic weekend, the only sad thing is a technical [exhaust] problem on Ricciardo's car." Regarding the team's title hopes, Marko added: "We have an outside chance, which we will try to use as much as possible. "Everything is very tight together."